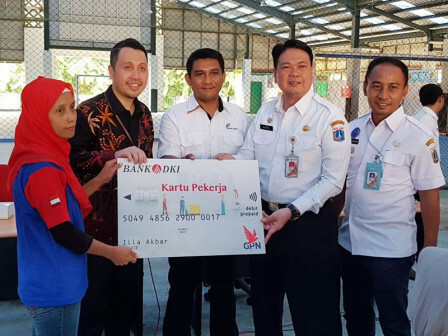 " Jakarta Government is committed to improve welfare of workers in Jakarta by expanding workers card's benefits"
Jakarta Provincial Government through Jakarta Manpower and Transmigration (Nakertrans) Dept. and Bank DKI has distributed 813 workers cards. Jakarta Nakertrans Dept. Head, Andri Yansyah stated, 173 workers cards have been submitted in the first phase which is on November 15 at Jakgrosir's Kramat Jati Central Market, East Jakarta. While for the second phase, 160 workers cards have been given on November 28 in Bidadari Market, East Jakarta and Kedoya Market, West Jakarta. "Third phase is slated on Saturday, December 15 at PT. Kaho Indah Citra Garment, Berikat Nusantara Area, North Jakarta by distributing 480 workers cards," he added, Monday (12/17). He explained, this workers card program is applied to prosper workers and their families. It is also expected to create harmonious and fair industrial relations in order to realize Jakarta as an advanced City with happy citizens. "Jakarta Government is committed to improve welfare of workers in Jakarta by expanding workers card's benefits," he mentioned. According to him, it is welcomed by workers in Jakarta who start to register to get workers card. Until today, Jakarta Nakertrans Dept. has received data from 147 companies with total 5,491 workers. "From that data, we state 3,716 registrants have passed the verification and its remaining is still on progress," he conveyed. As for the information, every workers card owner will get additional benefits such as free to ride Transjakarta bus, registered as Jakgrosir member, subsidy for food purchasing, and educational aid in form of KJP Plus for their children who attend school. In order to get affordable food price, they should buy food products in 111 markets managed by Perumda Pasar Jaya, 110 RPTRAs, 18 flats, 2 PD. Dharma Jaya's Meat Shops, and Trade Union Cooperatives established by Working Team. To get workers card, every worker must have Jakarta KTP (ID card), maximum income that equivalent to UMP + 10 percent of UMP, and does not limited to working period.